Who is having way belated second thoughts about that third helping of stuffing? Or the mac and cheese? Not to TMI you (which means I’m totally about to TMI you) but it’s going to take a tub of Crisco and a crowbar to get this rear end into my skinny jeans, y’all. Since I don’t have 1) Crisco in the house or 2) easy access to a crowbar, I’m going to have to exercise and eat healthy until I can get into my jeans the conventional way. This means I’ll be eating lots of comforting and veggie-heavy meals to get my body back on track… Like my Rich, Healthy Broccoli Leek Soup! This was my go-to during our recent extended stay in the mountains. Why? It’s delicious, it’s easily adaptable to gluten free or vegan, it’s done in 45 minutes or less, it’s packed with nutrients, it’s thick, satisfying, and filling. Go on, you say. Tell you more about this Rich, Healthy Broccoli Leek Soup. If you’re shopping for veggies at the farmer’s market, this is a slam dunk zero waste recipe and perfect Meal Without Plastic Challenge winner. If you’re shopping for veggies at the grocery store, as we were while traveling, this is virtually zero waste save for a tiny handful of rubber bands, twist ties (both of which I reserve for everyday use), and produce stickers. FINALLY, IT USES ALMOST THE ENTIRE BROCCOLI. THAT’S RIGHT, YOU EAT THE STEM TOO. Less food waste, more bang for your buck. You’ll notice this recipe calls for broth from chicken or vegetable base. 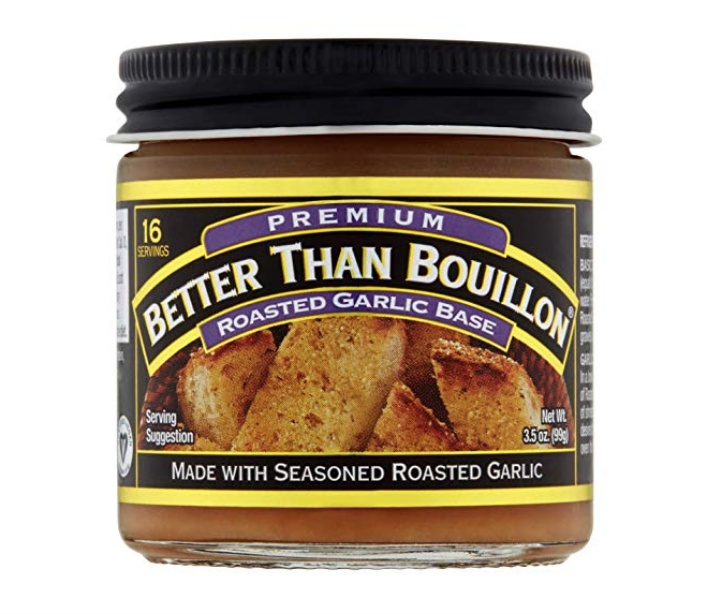 I personally feel this has a million times more flavor than canned broth but I also love that one tiny jar will last forever in the fridge and make TONS of broth. Less packaging, less trips to the store, more broth. Awesome, in my book. You can also find bases using organic and vegan-friendly ingredients. The jars are easily recyclable and also reusable. See Reese’s notes at bottom of post. Slice broccoli stem two inches from end (or where stem is woody) and discard. Then chop broccoli stem into half inch rounds and quarter. Roughly chop the flourrets, add all broccoli pieces to a large soup pot. Cover pot and lower temperature to a simmer. Let soup simmer for 30 minutes or until vegetables are soft. Season to taste with salt, pepper, freshly zested lemon or red pepper flake. Reese’s Notes: This was an awesome AirBnB-friendly recipe while we were on the road! All you need is a blender, Cuisinart, or immersion blender. No stock pot? Totally cool. I made mine in two smaller pots on two different burners. Tasted the same! And finally, as previously mentioned, my boyfriend actually PREFERS chunks of veggie in his soup so no worries if your blending contraption isn’t up to snuff. The flavors get even better after a day in the fridge. Remember that this soup recipe is INCREDIBLY FLEXIBLE. No leeks at the market? Totally cool. I’ve subbed in sweet onion or shallots and it’s still been divine. Going low carb? Leave that potato out, no biggie. It’ll still be awesome. Not a kale fan? Try substituting a more palatable leafy green in there! Look, at the end of the day a pureed soup is basically a hot vegetable smoothie, right? So mix it up, adapt it, have fun with it. And finally, remember that your vegetable scraps can be used to make a killer vegetable broth (I freeze mine until I have enough) and are easily compostable. Don’t have a home composter? Get you one here or keep an eye out for a community garden - most of them have a community compost heap to go along with the garden. No community garden? You can always bury vegetable scraps under 3-4 inches of soil. They’ll biodegrade away peacefully without attracting wildlife.